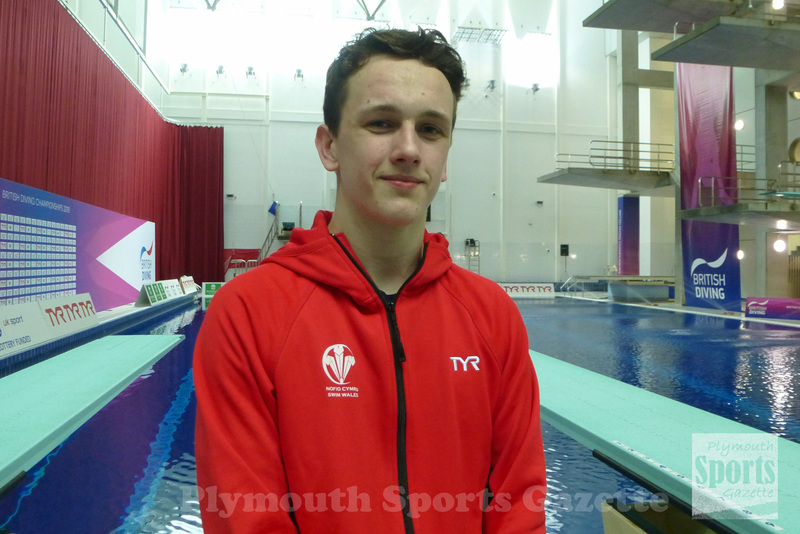 PLYMOUTH Diving’s Aidan Heslop will head to April’s Commonwealth Games in the form of his young life. Heslop, who will represent Wales in Australia, produced some eye-catching diving at the annual Armada Cup at the Life Centre. The 15-year-old claimed four individual gold medals, a synchro gold and also featured in a Plymouth Diving medal-winning team. He brought the four-day competition to a stunning end by winning the men’s platform title ahead of fellow Commonwealth Games athlete Matthew Dixon. The pair put on a sensational show on Tuesday afternoon in the three-dive final. European junior champion Dixon, who recently won the British senior title, was incredibly consistent scoring more than 75 points for all this three dives. But Heslop, who had qualified for the final in first place, produced two near-perfect dives that scored 86.40 and 82.50 points and then a solid effort of 67.65 points to take victory, much to his delight. Plymouth finished with the top five in the men’s platform competition, with Alfie Brown taking third, Connor West fourth and Tom Davis fifth. Heslop and Dixon had opened the Armada Cup by teaming up and winning the 14-18 year-old boys’ three-metre synchro competition on Saturday. Heslop also won the men’s one-metre, three-metre and high diving events. In the one-metre he triumphed by more than 40 points, with team-mate Hughes winning silver. Brown just missed a medal in that event by just over a point, while Harry Mason was fifth. Heslop and Hughes also finished first and second in the three-metre event, with Davis just missing a medal in fourth. Plymouth filled all the places in the high diving competition, with Heslop taking gold, Euan McCabe bagging silver and Josh Freeman claiming bronze. However, McCabe and Freeman both did finish the Armada Cup with individual gold medals. McCabe triumphed in the boys’ C one-metre. He also took silver in the three-metre, a bronze in the platform and a synchro silver with Zachery Anderson. Freeman won the boys’ B platform final ahead of team-mate Alfie Westerman, who was just 0.1 of a point behind in second. However, Westerman did get gold in the boys’ B three-metre event and took bronze in the one-metre category, while he and Freeman claimed a synchro silver behind Heslop and Dixon. Kayleigh Sinclair was another Plymouth diver to enjoy a highly-successful few days. She won both the women’s one-metre and platform finals. In the one-metre competition Sinclair had a good battle with team-mate Victoria Vincent, who came second. Vincent was also second in the women’s three-metre, but she did win a gold in the 14-18 year-old girls’ three-metre synchro with club and school colleague Madeline Coquoz. Maria Marasescu and Frances Burdentt were third in that synchro final. Summer Radcliffe won a silver medal in the girls’ C platform and also a gold medal with Southampton’s Tilly Brown in the under-13 one-metre synchro final. Meanwhile, there was a bronze medal for Scarlett Colbourne in the girls’ E/D one-metre final. The annual Armada Cup is one of the biggest events on the diving calendar. It attracted teams from Southampton, Albratross DC, Dacorum, Dive London, Luton, Sheffield, Cambridge, Aberdeen, Crystal Palace and Harrogate will be among those travelling to the event.